When you watch videos on Vimeo, YouTube or websites, you’ll notice a variety of background contexts for speakers, some of which are conducive and some of which are distracting. For example, you might observe baby owl wallpaper in the background, piles of books and paper, orange paint on the walls, personal portraits, or even doors and windows behind the speaker. 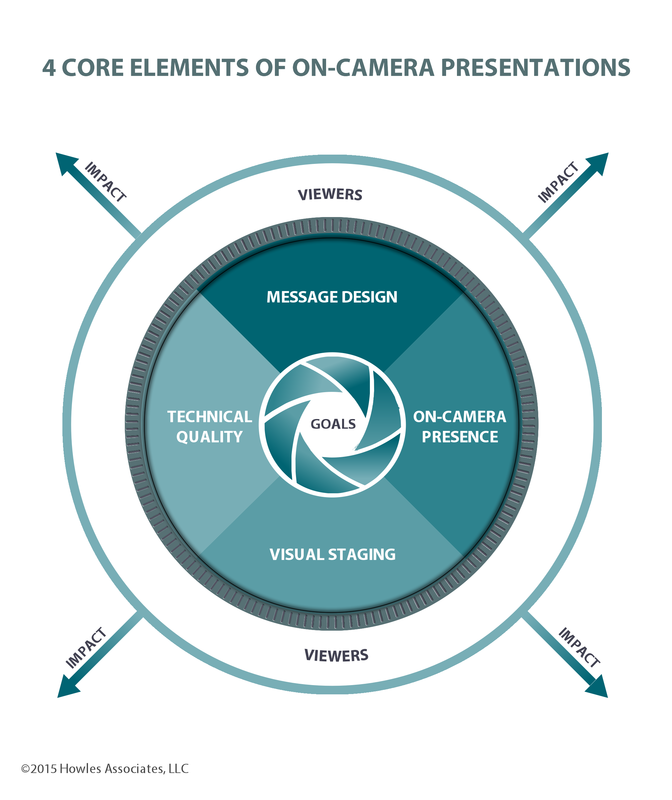 This staged background for your online video shoot is “visual staging,” and this is the third core element of the On-camera Presentation framework (see graphic below) that we’ll explore next. The guiding principle when it comes to visual staging is to remove distractions that could upstage your content. Your message (verbal and nonverbal) is the most important piece in an online video. If the clothing you wear, the desk behind you, the equipment on the floor, or the cluttered bookcase grab attention and focus viewers away from you and your message, your visual stage needs to be remedied. Let’s explore some of the things you can do to ensure that your message is the central element of your video. First, look through the monitor before recording to view the camera frame as a potential viewer would. You’ll observe excessive jewelry that competes for attention, the mini refrigerator in the shot that could be moved out of frame, the plant that sticks over the head of the presenter that makes her look like she’s wearing antennas, or the speaker wearing a black shirt sitting on a black chair that makes him look like Jabba the Hutt from Star Wars. When you just look at the scene in real life, you’re missing the perspective of the viewer who sees only what’s in frame. If, however, you are shooting a medical video, it is appropriate to have medical equipment in the background or to shoot on location in a medical context. Additionally, if you’re talking about travel, it’s appropriate to have a globe in the background, etc. However, when there is so much visual noise and competition in the background, it is useful to employ a backdrop to bring neutrality to the scene and make the speaker “pop” instead of the background. You can use a professional studio’s background or on a shoestring budget, invest in a solid color fabric that can be weighted and hung behind you, etc. Clothing also contributes to the visual staging. Avoid wearing clothing that will call attention to itself. For example, black can be absorbed by a darker background and white can reflect light. Extremely loud colors, stripes, and logos can draw our focus and distract our attention. Overall, it’s best to wear solid, muted colors on-camera. Overall, visual staging needs to keep the presenter the main event, and support the speaker’s content, not compete with it. If you follow these simple tips and techniques, you will be well on your way to staging a successful video.